In an article that’s long overdue we are putting the Elgato Tivizen and the Equinux Tizi head to head in this exclusive article. Seeing as the hardware under the hood is exactly the same we are going to focus on the user experience, breaking it down into the following categories. As gadgets go, I have to admit, that when I saw this little gem floating around on other review websites, I had to get it for myself and give it a thorough shake down. Personally to me some of the other reviews dedicate a few paragraphs, which are no way near enough for what this device can do and being honest, those other reviews miss out quite a few key important facts. So when the good people at Equinux offered me a loan of a unit I jumped at the chance and I have been reviewing this for the last few weeks. Remember the days of walking down the road with a ghetto blaster? Well I have been doing the new age version of that, walking down the road with my iPhone and the portable TV tuner 😀 Also, and I don’t recommend this, with the help of a colleague we conducted our very own driving a car whilst watching FreeView test. So in short we tried to make this review as real-world as possible like we do with most of our reviews. This really coldnt be easier. Download the Tizi application from the App store and run it. Turn on the Tizi, connect to it’s own hotspot (wireless security is available) and the box will start scanning for signals in your area. Our first attempt at a scan failed miserabley! This was no surprise as I barely get a signal with a boosted roof top aerial, so to remove the ever present issue of having a questionable tv signal, we jumped in the car and less than a minute later find ourselves with a nice strong signal. The Tizi started to do it’s channel scan and ended up picking up 67 channels which in my location merits an impressive result. It’s at this time we found a massive bug bear of this product, okay maybe not a problem, perhaps it’s by design, you can’t use your own external TV aerial. Yes that’s right you have no option whatsoever to use your household aerial, portable aerial or anything other than the small built-in aerial that comes with the hardware. If you are savvy enough you could use the end of a household aerial connector and with a bit of fiddling get a signal indoors for those that suffer in poor signal areas like myself. Smart location channel scanning works by using the iPhone GPS and hooking into, we presume, a database of transmitters to find the nearest transmitter to you. If you have your location services turned off you can do a full Freeview scan, however this will take some time as it will scan all frequencies in the spectrum. At first we thought it was a little flimsy and weak, however, as we were later to find out the flexibility was a more than a saving grace. At one stage of our testing we caught the aerial on a wall, thankfully because it’s designed to bend up to 90 degrees there was no damage. Hundreds of times better than those old telescopic extending aerials that were non-replaceable and the moment they had a chink anywhere in them you were left waiting for an inevitable snap and a useless TV tuner. It’s at this point you realise the whole package hasn’t just been cobbled together, there is a definite sense of feeling that designers have worked alongside engineers to make sure that the whole, user interface experience is intuitive and simple from the out of the box moment. So let’s get on with doing every unemployed persons favourite hobby, watching daytime television. As you can see from the images, a small display of your current channel is at the top and below is a mini guide which you can scroll up and down to see what is on. Clicking on the small circle with the arrow reveals a small synopsis of what’s showing now and sliding to the left shows you the next program details. All the information is provided OTA (over the air) a neat touch to the intuatitve interface. Basic yes.. functional, definitely! The blue bars you see under the channel logo represent how much of the program has played through already. It might have been during updates for the guide, having too many open apps or our iPhone 4 still running on iOS 4.2, but we noticed considerable scrolling lag going up and down the EPG, all areas of the GUI were just fine, so it’s probably just a combination of doing a scan and updating the interface that takes its one time only toll on the system. Further EPG update didn’t seem to affect performance at all. Some people are right to levy criticism at the fact that you can only see now and next programs, but then you would really have to ask the question, is this device really designed to be a portable DVR or just a portable TV viewer with an option to record programmes built-in? Quality wise it’s what you would expect from watching a video on an iOS device and freeview. Running at a full 25fps any transitions or panning shots were smooth with no issues at all with the quality and frame rate. Have a look for yourself in the sample video below. Note, because it’s on YouTube it’s obviously going to be compressed but I will get a download link to the source shortly. Rotating the iPhone to its horizontal position takes you into a full screen mode, the only thing you can do here is double tap the screen to zoom in, handy for broadcasts shown in non-widescreen format or for general zooming in on something. This does mean that if you want to record what you’re watching it’s a question of rotating the iPhone back to the vertical position. It does seem a touch bonkers that there is no way to record from the horizontal position, but it’s more a niggle than a drawback. Once again we are faced with the issue of the digital signal that powers Freeview. Due to no fault of the box itself, some channels can look like the old RealPlayer dial up streams as many of the daytime channels are compressed to within an inch of their lives, just to make sure we can have our fill of shopping channels and not miss out. It’s when you start hitting the bigger channels like BBC you really see the quality shine through. Colors are exactly as you would expect watching tv on the iphone with smooth scrolling of panning shots. There is an optional function to turn on a retina display function which really can make a difference on the new iPhone 4. The image comes across as being a lot sharper, crisper and even a touch more vibrant but this is at the expense of slowing down your phone a little. Playback of recordings is accompanied by the programme synopsis that is shown on the EPG. 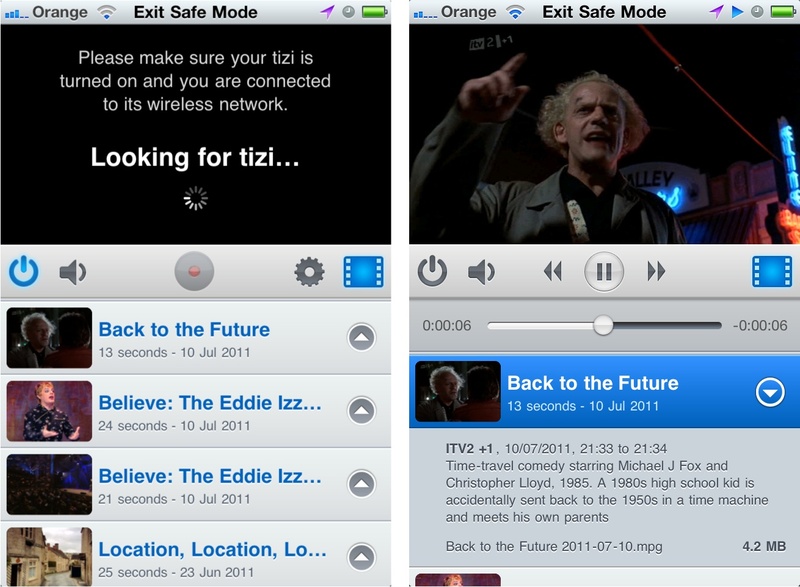 Recordings are only accessible via the Tizi application itself, unless you download them to your computer . Why this is I have no idea, as other applications seem to have the facility to record into the camera roll location but hopefully this will be addressed in a future software update. Recordings aren’t accessible in the normal Camera roll location because they are direct captures of the freeview stream (.ts) and not a standard Mpeg2 format. That explains having to use the app to watch recordings. The film strip icon on the far right displays anything recorded along with the program synopsis and file details like size and length etc. Recordings are stored on the iPhone in their own area, so you can’t use the standard camera roll to view, as covered above recordings are accessed in Tizi application. To pull recordings onto your computer you need to fire up iTunes, go into the application sharing options, select what you want to synch and either do it manually or when syncing your iPhone. An immeasurably better option would be if recordings were stored on the iPhone like other images and videos, in the camera roll location so you could use image capture to pull them easily instead of the iTunes faff. Even tho you couldn’t play them because of the recording format it would still make grabbing video to free up space more accessible. I do suspect that this is by design as you can use the TV tuner with their own desktop software called The Tube. Fortunately we will be reviewing this shortly. Worth noting is the fact you can only delete recordings via the application itself and not via iTunes. So if you are wondering why you are running low on storage space remember to check your recordings. This area seems to be the most overlooked part of any review for this box. In short, yes, you can watch TV on your Mac using the Tizi but alas this is something we are unable to test in our location. Its all the more a pity when you see what the tube software, designed to work with the Tizi, can offer an interactive form of television viewing experience. Keep an eye out for an upcoming review of The Tube from Equinux. It’s hard to see, or maybe not, where this product is aimed. Being an ex road warrior myself if I had a gizmo like this in the past I would of been a happy bunny indeed. It’s hard to find any real shortcomings with the Tizi that aren’t related to issues of signal but there are a fair few annoyances. Viewing video using the app itself rather than using the camera roll is the main one and when in landscape mode it would be nice to have a record button. On the plus side, the software is well thought out, intuitive with logical placing of information, making use of OTA data but not crowding the display. It’s easy to look at the price of the Tizi and write it off straight away. However, when you take into account a Wi-Fi dongle can cost up to £50, a USB TV tuner can cost almost the same (for a half decent one anyway) and then the portability issue of lugging around a Mac with you, it doesn’t seem so expensive after all. Yes okay, there’s more flexibility with the Mac and a bigger screen but also added weight and all. Six of one and half a dozen of the other.